Excitement is growing for our customers as construction finishes on their new purpose-built home in Gunnedah, New South Wales. 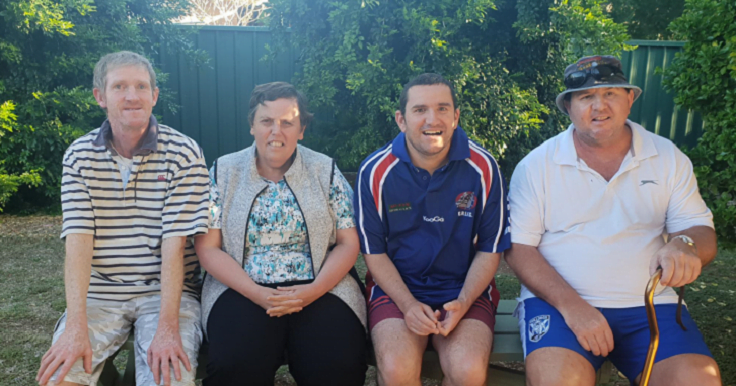 The excitement is growing for Kylie, Gareth, Darrel and Garry as construction finishes on their new purpose-built home in Gunnedah. The home that the foursome has been residing in for many years was no longer suited to their needs. Rather than renovate it, House with No Steps, a leading disability service provider, purchased land and constructed a modern and fit-for-purpose home. The home has also been built as Specialist Disability Accommodation, which is accommodation suitable for people with high needs. House with No Steps worked with GJ Gardner on the design and construction of this home. The disability service provider received the keys to the new property on Wednesday 17 October. “Collaboration was a key factor to ensure the design and layout would meet the needs of each of our customers. We have also considered the group’s future needs – we’ll be able to retro-fit equipment and aids if and when needed. “We’re very pleased with the result, and very excited to receive the keys. We look forward to planning the move in the coming weeks,” said Mr Wallace. The new home can accommodate five residents meaning there is space for one more housemate to join the fold. Kylie, Gareth, Darrell and Garry will have input about choosing their new housemate and House with No Steps is taking enquiries now. To apply, a person will need to have an approved NDIS Plan that includes Supported Independent Living and be eligible to reside in Specialist Disability Accommodation.